Clear delivery zones around your branch, store or warehouse. 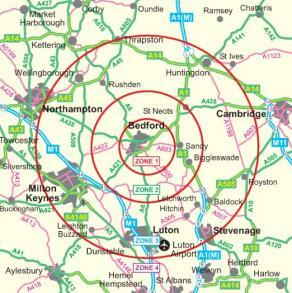 Map centred on your location showing concentring circles or areas. Background map as detailed or simplified as you wish, just like a commercial road-atlas or only the main roads. Display the map in your reception area, door-drop flyers, brochures and web site.